One by one, the musicians climb on stage and take their places : B.B. King, Eric Clapton, Buddy Guy, Robert Cray, Bonnie Raitt, Jimmie Vaughan, Dr. John and Art Neville. Vaughan, standing at center stage, launches into "Six Strings Down", a moving tribute to his late brother, Stevie Ray, whose memory has drawn this group together. The guitarists fall in, each finding a corner of the song to call their own; King plays fills to Clapton's solo, Cray fires off economical, chiming counterpoint to Raitt's stinging slide, and Guy unleashes piercing single-bote bends to answer Vaughan, who's finger-picking the main theme on his battered Strat. Suddenly, the song blasts into the stratosphere, a gorgeous mosaic of clarion guitar tones. And when Vaughan shuts his eyes and sings, "Alpine Valley, midding of the night, six strings down on a heaven-bound flight," the music levitates to such a degree that for a lingering instant, no one would be surprised to see Stevie Ray stride on stage, black had on head. 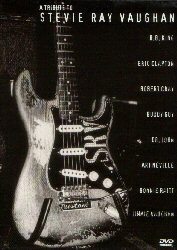 This was a transcendent moment in a remarkable night, May 11, 1995, when the blues royalty gathered on a Austin, Texas, soundstage to remember Stevie Ray Vaughan, the best way they know how - with their voices and their fingers, It is a method of communication with which Stevie was well-acquainted. "Stevie spoke through his guitar," Jimmie Vaughan. "It was his voice and much more. It was his instrument of liberation, his magic sword. The music meant everything to him, so there was only one way of paying tribute - by making the music pure and natural." I've had this on video and now DVD for about 7 years now, and never get tired of playing it. The entire concert is just magic as (nearly) every musician playing on it is of legend status. The solo number Eric does is by far the standout song on the DVD. If anyone ever asks me to give them an example of why Eric is brilliant, I show them this performance. I have a lot of classic Clapton snippets on DVD and VHS and this is one of the finest. He proves that he is the master of laid back blues soloing and does it with ease. It's the perfect blues guitar/vocal performance.